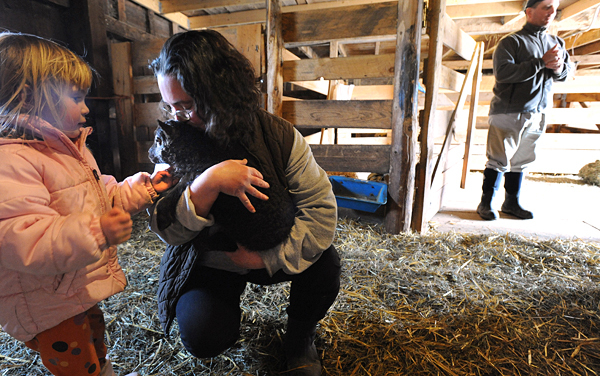 Violet Willis holds Cookie the five-day-old lamb so her daughter Brynne can pet her at their Dennysville farm Wednesday. Violet and her husband Mark Willis (right) started the Kilby Ridge Farm five years ago. 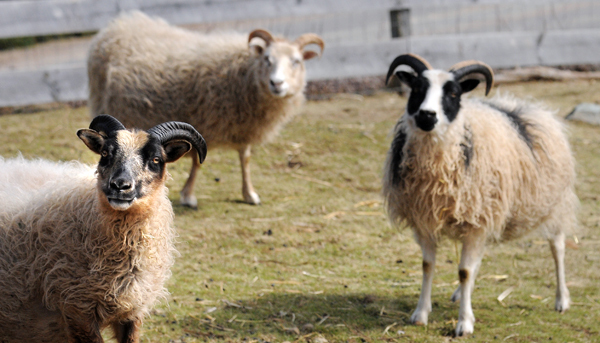 They raise icelandic sheep, poultry and grow fresh produce. The farm store at the Kilby Ridge Farm owned by Violet and Mark Willis in Dennysville. Icelandic sheep at the Kilby Ridge Farm in Dennysville. DENNYSVILLE, Maine — Violet Willis leaned against the fence surrounding a dozen pregnant Icelandic sheep, where the quiet of a Dennysville afternoon was broken only by a lamb bleating, a duck quacking or a hen’s excited cackling. It’s the midst of lambing season — 10 have been born already and another 20 are due within the week. The sheep, their curly coats ranging from a deep chocolate color to champagne or black, nuzzled their newborn lambs in immaculate stalls or casually walked through the paddock. “I want to feed the sheep,” Willis’ 3-year-old daughter, Brynne, shouted, running from the shadows of the barn in a lilac jacket and pink boots. Willis and her husband, Mark, and their children, Brynne, 3, and Declan, 11, own Kilby Ridge Farm, a small family farm high above the Dennys River. Statistics show they are part of a growing movement across Maine of young, energetic farmers establishing small diversified farms. A snapshot of Maine’s agriculture industry over the past several decades reveals some major losses: The broiler industry closed; there has been a dramatic decline in the number of dairy farms and egg producers; and even some commodity crops, such as potatoes, have struggled. But statistics over that same time surprisingly show that, unlike the rest of the country, the number of farms in Maine has remained stable. U.S. Department of Agriculture data show that the reduction in the number of large farms producing traditional commodities is being offset in Maine by an increase in the number of smaller farms. Today, there are an estimated 8,100 farms in the state, many of them just like the Willis homestead — small and diversified. “This is the future of agriculture in Maine,” Mark Willis said, looking across his paddocks. Farms selling less than $10,000 worth of goods now make up nearly 70 percent of Maine’s agriculture fabric, according to the USDA. The number of small organic farms nearly doubled from 319 in 2006 to 635 just two years later. Many young, bright professionals, much like the Willises, founded their farms because they were seeking a more productive, rewarding and sustainable lifestyle. Mark Willis said it was no coincidence that they made their decision to move to Maine on the same day he was stuck in traffic in Virginia and regretting every second of it. “There was no question in our mind that we would farm someday, and I have to admit, we have never missed the hubbub of the city,” Violet Willis said. Still leaning against the fence, she took stock of her lifestyle. Mark and Violet Willis were high-powered individuals eight years ago, living and working out of northern Virginia in the Washington, D.C., area. Violet operated an antique costume and clothing business; Mark was an attorney and a technical adviser with U.S. Army Intelligence. They lived a city life — filled with work, family and friends, and punctuated by Sunday dinners of wine and lamb. But there was a restlessness in their hearts, they said, and they knew that neither city life nor their jobs was fulfilling them. A four-day weekend to Maine in 1994 planted a seed, they said, that bloomed into a quest for a simpler, more rewarding existence. Several years later, when Mark Willis became ill and was forced into bed for two weeks, the couple became reflective. Five years ago they purchased an 1840 farmhouse and 20 acres here, bought a small herd of sheep with the best genetics they could find, and have never looked back. “If it is in your heart, it is right,” Mark Willis said. 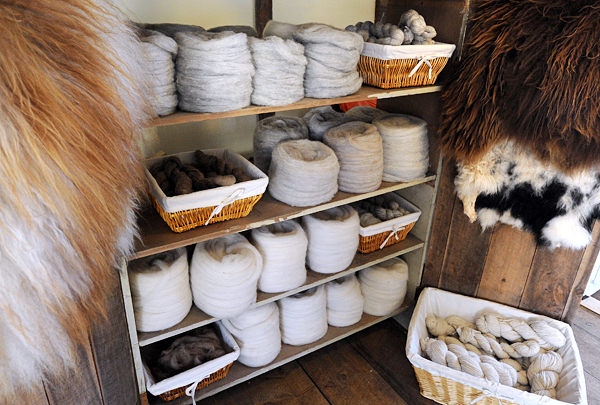 Today the two breed and sell their sheep and wool through local buying clubs, as well as operate a small farm stand for vegetables, frozen poultry, meat, eggs and other farm-grown products. They are planning to add a few more sheep, clear a few more acres for pasture, and establish a sheep dairy and cheese-making facility. Mark Willis still works in technology — he is the applications security adviser for a firm in southern New England — but now he walks from the barn to his home office to hold an afternoon meeting over the Internet. Today the two refer to themselves as “shepherds” on their business cards, and the family is thriving in this tiny Washington County community.